Michael Miu (苗僑偉) and Elena Kong (江美儀) were spotted tugging each other’s clothes at the beach while shooting for TVB’s new television drama Line Walker <使徒行者> last week. In the scene, Elena and Michael spent approximately two hours in the water with their clothes completely soaked. Nonetheless, the two veteran artistes displayed their professionalism and did not rest until filming was completed. 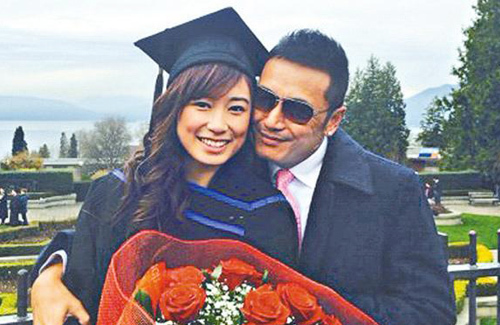 Recently, Michael Miu’s 23-year-old daughter Phoebe, who recently graduated from University of British Columbia in Canada, has been sharing many of her own private photos with her friends through Instagram and Facebook. Tabloid magazines reported about Phoebe’s intimate behavior with her male friends, and both Phoebe and her younger brother Murphy became targets of the Hong Kong paparazzi. Does anyone know what Phoebe was studying at UBC? Oh that is a good one………a degree called “B-Part”………. According to her LinkedIn profile, she studied sociology. Wow she went to UBC, c’mon, at least major in something worthwhile. Does it matter when her daddy is Michael Miu? I think the media is just WAY over exaggerating stuff. I’ve seen her instagram and she just seems like a normal college girl…not the wild partying type who wears skimpy clothes and cake herself in make up. She does take pictures with boys but they’re just friendly photos by western standard. Just saw a pic of her from the original link, she went to the beach with her friends, and she wore a black 2 piece bikini. I think is fine, everyone in the beach wore bikini, you can obviously see she went wtih whole bunch of friends, not just with the boy alone. Heck, if you are young, have nice body, you would also wore bikini to show it off. Michael is a good parent seeing that he gives good advice to his daughter. Both Michael and Jamie have brought up their daughter in an apparently loving and caring home and most probably taught her good moral values. She is grown up now and hopefully what has been taught her won’t be lost. Michael certainly seems to have full trust in her. Love how Michael took indirect shots at the paparazzi. Agree. This was a clever response. I found it most interesting that he apologized to his daughter. Very smart. Not privy to the FB & Instagram entries, I can only guess the celebratory pics are from the graduation parties. I would celebrate if I graduated and received a degree. If that is the case, then the media will stretch the pics into a story. Dam, ppl here are crazy trying to look at her Instagram and LinkedIn. Who doesn’t party hard hard. As long you know what your doing, its all good. Since people put it up on internet they are meant to be viewed. from looking at her photos, I think this girl is a very down to earth one, and very active! she does sport, and knows how to enjoy her life which is good. Unlike a lot of other celebrities’ kids that show off their spending habit with expensive brand name stuff. Hong Kong news media is lame. This would’ve never made print had this been Hollywood. I used to party and visits pubs or discotheque when I was younger. It was how you want your life to be, I was happy to be drinking with friends, sometimes hit the dance floor. To me I’ve done that and there was nothing wrong. As long as you’re aware what you’re doing and take care of yourself, I dont think there’s any problem, as long as no excessiveness in everything you do. Of course no drugs. Yes, maybe this girl was being watched just because she’s a daughter of an entertainer that’s all. His daughter is now living adult world. She is not a child anymore. Her parent should let her be independent. Hope she’ll stay out of trouble & find Mr. Right. The media needs to calm down with their exaggeration of Phoebe’s “wildness” and their label of ‘because she was brought up in the west where everything is more wild’. No, Hong Kong can get just as wild; it’s ridiculous to say that the west is more ‘open’ etc etc. Phoebe is just a standard 23 year old enjoying her life. She’s not doing drugs, not pregnant – partying and drinking is quite a standard thing to be doing at university! Ah HK media….